Stranded in the north-eastern corner of Turkey on the road leading to the perenially closed Armenian border poor old Kars has come in for a lot of bad publicity, not least after the publication of Orhan Pamuk’s famous novel Kar (Snow) which capitalised on its grimmest aspects including some basalt buildings that look very dour, especially in winter. It has also suffered from its proximity to the ruins at Ani since tourists often have their sights so firmly set on that prize that they fail to leave time for Kars itself. 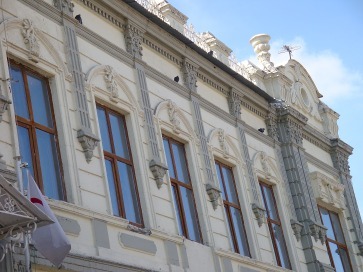 That’s a shame since Kars is a pleasant small town, laid out on a grid plan that makes it easy to navigate and home to whole neighbourhoods of old Russian (“Baltic”) buildings that, if properly restored, could make this one of the prettiest and most liveable towns in the country. 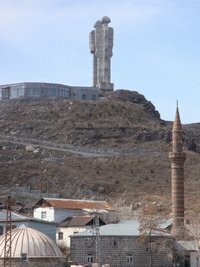 In 2011 a statue in Kars became a cause celebre. İnsanlık/Dostluk (Humanity/Friendship) was built high on a hill and was said to be a symbol of friendship between Turkey and Armenia. Be that as it may, it was also said to have upset the prime minister on a visit. Shortly afterwards it was torn down although from the get-go some locals had insisted that would be its fate since it had been built without planning permission. 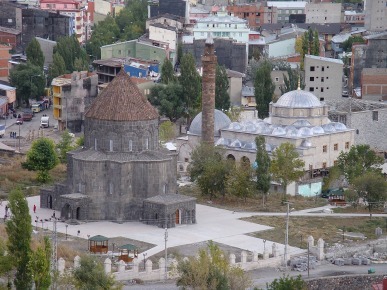 Kars is not one of those venerable Turkish towns whose history can be traced back to the Greeks and Romans. Instead, it has always had its face firmly turned towards Russia and what is often called Transcaucasia -- modern Georgia and Armenia. In the 10th century it became the short-lived capital of the Armenian Bagratid dynasty, one of whose kings, Abas I (928-951), was responsible for the famously brooding round Church of the Holy Apostles. This is in the most historically interesting part of town, where it huddles beneath the dramatic Kars Kalesi (Kars Castle). Compared with some of the delicate buildings to be seen at nearby Ani (the main reason why most people come to Kars in the first place), the Church of the Holy Apostles is a clumpy building, the carvings ringing its central drum vaguely reminiscent of children's drawings. The church was converted into a mosque after the Ottoman conquest, then became an Orthodox church when the Russians rolled into town. Today it's affiliated with the large Evliya Camii next door, a building erected around the shrine of the 11th-century Muslim saint Ebu'l Hasan Harakani that dates back to the 16th century but which has been so ruthlessly restored that it now looks brand new. Walk round to the back, though, and the actual shrine of the saint is encased in a lovely wooden frame. Just near the entrance you'll also see the hexagonal Kale Burcu (Citadel Tower), once one of seven towers set into the outer ramparts of the castle. It dates back to 1153 when it was commissioned by the Saltuk leader Melik İzzeddin although heavy restoration has robbed it of much air of antiquity. High above the church and conspicuous from all around town, Kars Kalesi was also a product of the Bagratid period, although it's been remodelled time and again over the centuries and was until recently occupied by the army. History relates how first the Byzantines and then the Selçuks laid siege to the castle, the latter driving out the Bagratids in 1064, just a couple of years before the French in the shape of the Normans occupied England. There's nothing left now to show for the Selçuk years, nor yet for the lengthy Georgian occupation that followed from 1205 to 1514. 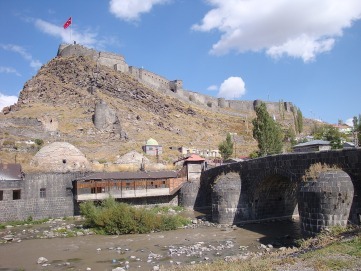 Then Kars settled down as part of the Ottoman Empire and it was during this period that the picturesque Taş Köprü (Stone Bridge) was built across the Kars Çayı (river). The original version succumbed to an earthquake and was rebuilt in the early 18th century when the Cuma and Mazlum Ağa hamams (Turkish baths), both now derelict, were built on either side of the river. The Beylerbeyi Palace, a huge but austere building on the slopes beneath the castle, was erected in 1579 for the fearsome governor, Lala Mustafa Paşa. It survived virtually intact until 1878. In the 19th century the Ottoman rulers of Kars found themselves fighting off an expansionist Russia that managed to occupy it three times, the last time from 1878 to 1918. It was during this period, and particularly between 1890 and 1917, that the town's wide streets were laid out and most of its fine stone-built "Baltic" housing went up. The Baltic buildings can mainly be found in the compact area between the Kaleiçi and Bayrampaşa Mahallesis. They are truly remarkable and come in a variety of shapes and sizes, some mere rowhouses that would presumably have been occupied by poorer workers, others sturdy mansions with imposing side arches wide enough to admit the carriages of their wealthier owners. Some of the houses have been painted in chirpy yellows and greens, their Neoclassical details carefully highlighted in contrasting colours. The finest are still occupied by assorted state bodies -- schools, hospitals and government offices; one of the finest of all, on Ordu Caddesi, serves as the local Sağlık Ocağı (clinic) despite having a façade so ornate that in Italy it would probably be an opera house. More impressive would have been the Alexander Nevsky Kilisesi (church), now the Fethiye Camii, where two minarets have replaced the original domes. 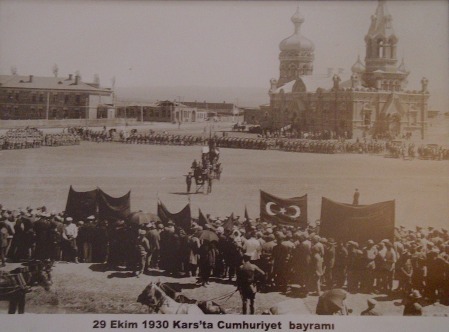 If you pop into the exhibition hall housed inside what was once the 18th century Muradiye Hamamı (near the Taş Köprü), you will be able to see a photograph of Republic Day celebrations taking place in what looks like a cut-down version of Red Square in front of the church in 1930. Stroll along Cumhuriyet Caddesi from the Fethiye Camii to the Kars Museum and you will notice plenty more of fine old houses crumbling away in the side streets backing onto the railway. More obviously, the army still occupies a swathe of stone buildings right in the town centre. Their barracks are named after Kazım Karabekir, the general who finally signed a peace treaty with Russia in 1921; a railway carriage kitted out for his personal use also stands on the grounds of the museum. To find out more about the 19th-century toings and froings you should drop into the Gazi Ahmed Muhtar Paşa Evi (house) on Faik Bey Caddesi. Born in Bursa, Ahmed Muhtar Paşa (1839-1919) was an Ottoman commander who went on to become one of the empire's last grand viziers. 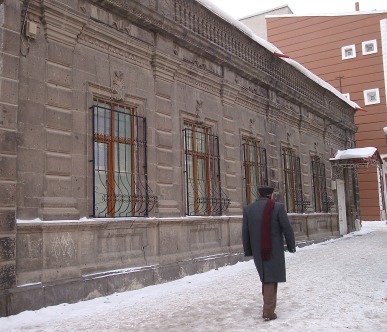 The building he used as a military headquarters in Kars was recently restored and the upstairs houses a small museum devoted to the Turco-Russian wars. 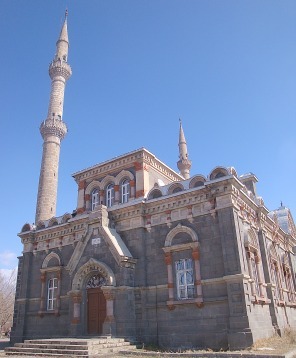 You might also want to drop into the similar stone building on Cumhuriyet Caddesi that houses the Çağdaş Yaşamı Derneği (Contemporary Living Association), where, in an upstairs room, you can read the original account of the Russian victory of 1877 as it was reported in the UK's Harper's Weekly. Near here you will find the Kars Museum (closed Mondays), home to an interesting collection of archaeological and ethnographical artefacts. If only it were in a more central location. This newly renovated 50-room hotel right on the main street has a surprisingly plush bar at the back of an otherwise uninspiring lobby-reception area. Bedrooms are comfortable and well-equipped if somewhat overpriced. Kars’ newest 34-room hotel reeks of designer but is none the worse for that. The ground-floor sitting area and bar are decked out in black and white, while the bedrooms are dominated by striking photographs of Kars. A fitness centre and hamam are up and running; the pool is yet to come. What a shame that the high-rise building was planted here though where it’s completely at odds with the mainly low-slung “Baltic” architecture of the surrounding streets. The Güngoren has reopened after a complete makeover taking it up to three-star standards. Reports are good although inevitably it is no longer priced for backpacker budgets. 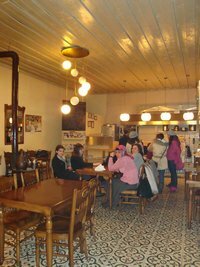 Kars may not seem the most obvious place to sample Akçaabat köfte but this unexpectedly trendy-looking small restaurant pulls in the punters for its simply served and very tasty meatballs. Upstairs away from the busy street action, this newish restaurant tries hard to create a more upmarket ambience with its table settings and low lighting. Prices for a range of Turkish staples remain very reasonable, and the trout is absolutely delicious. Delightful, ramshackle tea garden near the Evliya Cami right beside the river and with views of the castle. Tea samovars plentiful. Ditto nargiles. 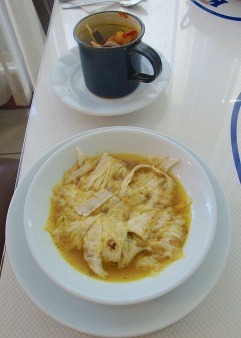 Cheerful and long-lived lokanta serving standard dishes with some original extras such as piti, a variation on the Iranian abgusht, a meal in a cup basically. 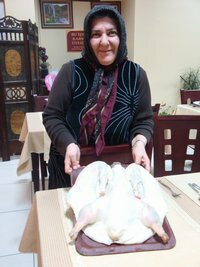 The owner Tahsin Kaya is always good for a chat about local life. Set up by the Kamer Vakfı (women's rights charity), this unexpectedly stylish restaurant serves home-cooked food against a backdrop of tiled floors, low-slung lighting and Mardin-style seating. Kars’ airport (KSY) is 10km south on the road leading towards Kağızman. Kağızman dolmuşes pass it. There are daily Turkish Airlines flights from İstanbul and Ankara. Kars’ new otogar is 3km northwest of the town centre on the Ardahan road; most bus companies run free servises from the Eski Garaj at the eastern end of the centre. From here there are buses to Erzurum (203km) although you can also get a dolmuş there from the town centre. From the Eski Garaj there are frequent dolmuşes to Sarıkarmış (45 mins), and infrequent ones to Arpaçay (45 mins), Kağızman (60 mins) and Ardahan (90 mins). It’s a very pleasant drive from Kars to Artvin passing through Ardahan and Şavşat. From Kars to Ardahan the scenery is rustic and open with huge flocks of sheep, herds of cows and gaggles of geese. The stone-built houses beside the road are almost unbelievably basic, their mud roofs increasingly covered with more waterproof blue tarpaulins. From Ardahan to Şavşat the scenery becomes more and more dramatic as it climbs to the Çam Geçidi (Pine Pass, 2470m) and then switchbacks back down again. Suddenly the slopes are thick with firs and the cows are ambling across the contour lines amid views that come straight from a Swiss chocolate box. It is quite unbelievably beautiful, and the villages, when they appear, are completely different from those around Kars, built here of wooden planks and roofed with tin (saç).